This is a delectable, light, and less unhealthy dessert that tastes great all year but is especially yummy in the summer. We used to make it a lot for Fourth of July using blueberries and strawberries but it’s excellent for any gathering any time. I grew up eating this dessert so I can tell you that kids will like it too! It’s a major hit at any potluck and in fact, it’s requested every time I’m invited to an event. The most popular version of this is just strawberries but we also enjoy the strawberry/blueberry combo or peach. What flavors do you want to try? This sounds like summer! And delicious! 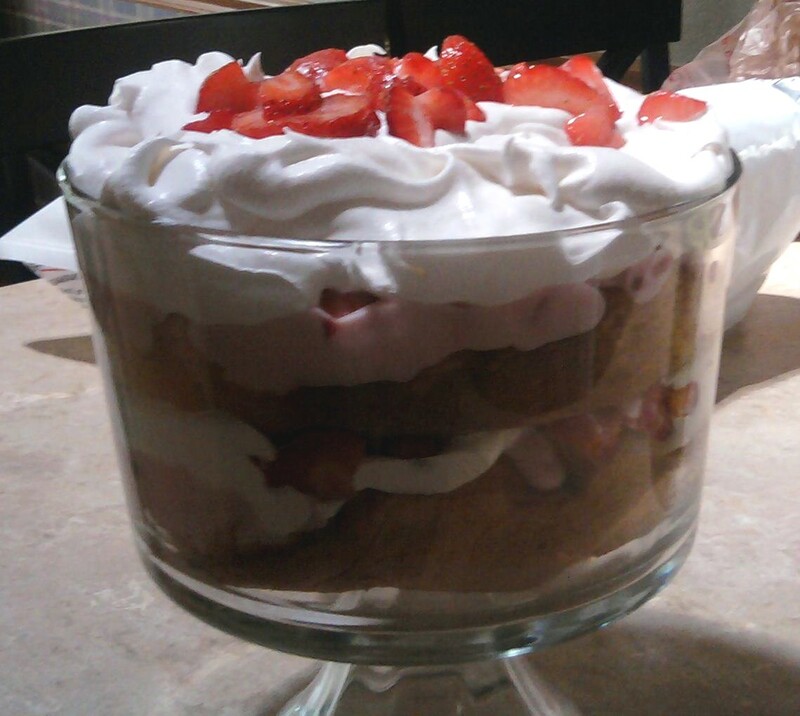 I’m guessing that you made this and it was so good that the trifle dish is now empty! ha ha! I make a “fruit and yogurt pie” almost exactly like this — I use a graham cracker crust and mix corresponding flavors of fresh or canned fruit (canned peaches seem to work in a pinch), and the Cool Whip, and stir them together before spreading into the pie crust. Yummy! I can’t wait to try yours! OMG this looks delicious! I’m going to make this this weekend with my grand daughter! You should! It’s easy to make and very kid friendly. Let me know what flavor you end up with and how it goes over! I’m going to make this today with strawberry/banana. Oh! Let us know how that turns out. Are you using banana-flavored yogurt or vanilla? I have never used yogurt in my trifles before! Thanks so much for the inspiration. Your trifle sounds delicious!